Streamers | Pandorapedia: The Official Guide to Pandora | Own AVATAR on Blu-ray & DVD Now! 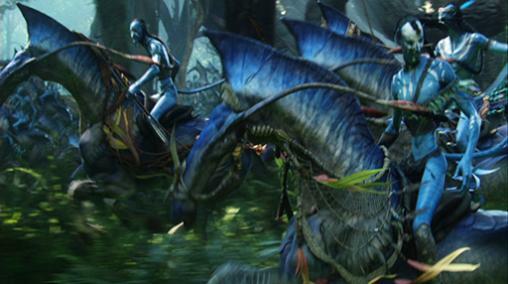 Like the banners and flags of Earth, the Na'vi streamers are used for both identification and clan pride. The intricate images that decorate the streamers indicate the clan's name. These images can act as a symbol of inspiration in time of crisis. The images reflect a clan's organizing theme, or special point of pride. The U'imi tomac'ta, for example, are known for their tremendous love and respect for banshees. Function Visual identification of various Na'vi clans, both for ceremonial and practical purposes. Materials and Construction Highly decorated animal skins attached to wooden frames. Can also be attached to harness of direhorse, banshee. Notes Used as a rallying point during battles.